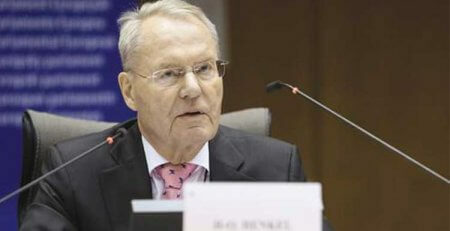 PROMINENT German MEP Hans-Olaf Henkel has urged Berlin to mount pressure on the European Union to bow to British Brexit demands to minimise the risk to German industry. The vice-chair of the European Conservatives and Reformists Group in the European Parliament insisted the prospect of British banking jobs moving to Frankfurt only „obscures the risks of threatened jobs in the industry“ under current EU plans. 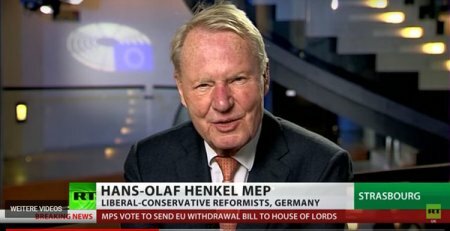 In the wake of David Davis and Philip Hammond’s Brexit mission to Berlin and Munich, in a bid to win German support, Mr Henkel said the pair „rightly point to a fact that is virtually non-existent in the German discussion of Brexit“. 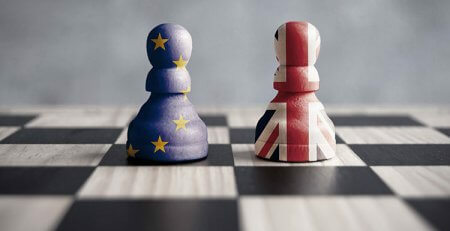 Brussels have been reluctant to offer Britain a bespoke trade deal after the country leaves the European Union in March 2019. Instead, the two parties compromised on a transitional period, which will mean the UK is attached to the EU in all but name. Brexit news: Hans-Olaf Henkel urges Berlin to pressure EU to minimise Brexit risk on Continent Moving forward, the European Commission’s chief Brexit negotiator, Michel Barnier, also said it was impossible for Britain to negotiate a trade agreement with the bloc which also includes services, as well as goods. 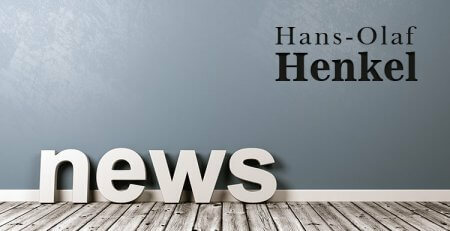 Mr Henkel has said it is now in the interests of Germany to pile pressure on Brussels in order to minimise the damage done by Brexit on either side of the channel. The German said: „Hammond and Davis rightly point out that Germany is responsible for a quarter of all exports into the United Kingdom and that it should, therefore, be in the interest of the German industry to accommodate the British as much as possible. „Britain is not only the third largest export market for German products, but after Brexit, the UK will be the EU’s largest export market, ahead of the US and China. „that is why Germany should urge Brussels to support British demands for uninterrupted access to the service and financial sectors. „I am missing a clear opinion from the German industry, which obviously subordinates their interests to those of the German financial industry. The prospect of new financial jobs in Frankfurt’s office towers seems to completely obscure the risks of threatened jobs in the industry. Mr Henkel also insisted Brussels was partly to blame for Britain’s decision to leave the bloc, with its bid to create a ‚United States of Europe‘, meaning the EU should attempt to minimise damage to its members by being kinder to UK negotiations. The German added: „Sure, it was the British who decided on Brexit – but let’s face it, apart from the fact that too much Europe was never in the Treaty of Lisbon, too much Europe also created the basis for the British referendum in the first place and the outcome was massively influenced by the German refugee policy. Germany is leading the way to enable privileged access to EU markets for British financial firms, in return for payments to Brussels, despite previously publicly being keen to exclude financial services from a future deal. Government figures across EU capitals are discussing ways to ensure Britain will be allowed a wide-ranging trade agreement as it leaves the bloc. German officials from two government departments in Berlin said Britain could not expect a trade deal which includes financial services unless it agreed to substantial budget contributions and followed European law. This comes as European leaders seek to plug the financial blackhole left by Brexit after the EU’s budget commissioner, Gunther, Oettinger, warned the bloc’s finances would be about (EURO)10 billion a year smaller after 2020.
by David Marsh is Chairman of OMFIF.